In my last blog I introduced you to an amazing young girl named Stella as well as the RESILIENCY lessons I learned from my beautiful African friends. The phrase ““Life may not always be going the way I think it should… but I am going to be Ok.” was about to get real! After returning home from Kenya, I set back into my comfortable routine of carpool, laundry, work and the million other Mom tasks that consume my days. It would have been easy to say …well I did my part, pat myself on the back, and get back to my reality. Alas, even amidst the busyness I could not erase the faces I had seen or quieten the voices I had heard. I continued to feel an incredible burden to share the stories of these children beyond just telling my friends and family. People needed to know that all over the world children were trying to live without parents and that programs like ZOE needed their support to make a difference. I was in fact…“gloriously ruined”. This is a term I learned from Kay Warren, Pastor Rick Warren’s wife. Those who have traveled to places of extreme poverty or devastation know exactly what I am talking about. For me, this term refers to the wrestling and flood of emotions that I encountered as I tried to understand the injustice of what I had witnessed. For the first time in my life I had to try to sort out how I was going to deal with living in a society of excess knowing firsthand that others are struggling daily just to meet the basic needs of life. Sure, I am a counselor and I had read and studied about extreme poverty in the US and abroad, but now for me poverty had names and faces attached. I would lie awake at night thinking about what if those were my children crying out in starvation. My Jonah, my Spencer, and my Landry; I would want someone to fight for them. My trip had also made me painfully aware of the amount of privilege that our children were being raised in daily. I desired for my children to not only know how incredibly blessed their lives were, but I also felt that somehow, they could be a part of the solution. Like many parents over the years we had tried to instill compassion into our children through various avenues. Often that included reading them books about people whose lives looked different than theirs. I decided that a children’s book for ZOE could help highlight not only the dire problems with orphans but also this incredible model that was transforming their lives. After getting the green light from the ministry to try this idea, my mind set into motion like the Mad Hatter running to the tea party! Well, not exactly. I had always secretly dreamed of writing a children’s book, but I truly had no idea what I was doing! So, I did what every book addicted, aspiring writer does…I researched and read everything I could on writing for children. (Note: I may also have googled “How to write a children’s book”). Then there was this nagging problem called TIME. Any Mom with young children knows all too well that you never have time to do the things you want, you must find it. Most aspiring writers have lofty notions of spilling out words onto the page in a nice quiet coffee shop. Well, maybe that worked for Hemingway but not for this working Mom of three! I wrote and edited waiting in pick-up lines, waiting for practices to end, and waiting for pots of noodles to boil. Basically, anywhere I could and I assure you it was anything but quiet! God began to write this story in my heart and trust me when I say He would not let me put it away. After creating what I thought was the best children’s book since Dr Suess wrote Green Eggs and Ham, I submitted my final draft to the ZOE staff. I obsessively checked my inbox waiting for the reply that said, “Yes, Let’s do this”! However, the response was not at all what I expected and in fact to be truthful, it brought me to tears. ZOE could not use the story I had created and I was heartbroken but it was not for the reasons that you might think. In my efforts to create a story that children could relate to, the original version of the book used personification, with whimsical talking animals to relay the plight of the children and the work of ZOE. I was unaware that in the early years of the organization, ZOE spent a great deal of time educating people that African children were not synonymous with animals. A difficult concept for many of us to grasp but it was a reality. I just could not wrap my mind around the fact that any child could be perceived as less than human. I seriously sobbed for an entire day. Take heart my parent friends who are in the throws of raising strong willed children, this is when being a strong-willed child serves you well in life. I remembered my lessons on RESILIENCY and was supported by the idea that if these children could overcome all those challenges…then I could persevere. In fact, this just fueled my fire to create a book that not only relayed the story of the program but would ensure these children were portrayed in their true humanity. The idea of paralleling Stella’s day with an American child her age became the new story line. Initially in the story process, Stella was the oldest child in her family just like the true Stella. During a writing revision session with another writer, I was encouraged to not make Stella the head of the family. Given the heavy topics such as the death of parents, and all the challenges the children would face in the story, it was best that children would perceive the main character had someone to champion for her. The character of Caroline was added to be her older sister and fulfill that purpose. 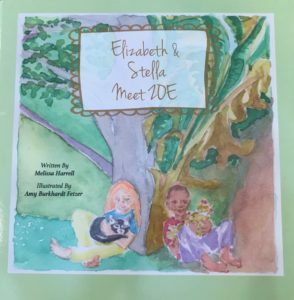 A children’s book is NOTHING without illustrations…enter the one and only Amy Burkhardt Fetzer! I always say that Amy is the yen to my yang. I am the most hyperactive, high strung, Type A, person you could ever meet. Counter that with the coolest, most Zen Yoga teacher ever…and there is Amy Fetzer. I am still in awe that a mother of 3 would take 6 months out of her life with no financial compensation to lovingly draw this artwork. Years later, I still get emotional just typing these words. This woman loves Jesus! The incredible beauty about Amy’s work is the prayer and heart that she puts into each piece of her art. She has never traveled to Kenya or met the children that she brought to life but when I saw her initial images, I was instantly transported to Kenya. Her humble spirit and love for people flowed from her hands and into her art as she brought the children to life on the pages of the book. So, then the book was printed and we all lived happily ever after. Survey says…WRONG! The next step was publishing. This became a whole new adventure exploring self-publishing versus traditional publishing and I will waste no space on this debate here as this topic already has countless blogs and books dedicate to this subject. We chose to self-publish because given the purpose of the book we wanted to maintain 100% artistic control. To self-publish we also had to use Crowd Sourcing to fund the process and we were blown away by the generosity of so many. If I had to sum up this process in a sentence it would be the old adage, “You Can’t Judge a Book by Its Cover”. Until now, no one really knew all that went into creating Elizabeth and Stella Meet ZOE or any other book for that matter. Likewise, we never truly know what has gone into creating the story that makes up the life of a person, we just see the outward cover. We don’t usually think about the joys, challenges, and and sorrows they have experienced, unfortunately, we just make a quick judgment based on appearances. I wonder just how much more peace we could bring into our world and lives if we stopped to make this one little change. Today, take the challenge to truly get to know the story of a person’s life even if their life is much different than yours. Don’t let fear stop you from taking this step or your next life step. Whatever your life plan, even if it gets reworked, just like this book, you might wind up with a better version than you ever dreamed! Until then may you be well, may you be loved, and may you know true peace. Read more about the journey of Elizabeth and Stella Meet ZOE and watch Amy’s artwork move from sketches to completion.